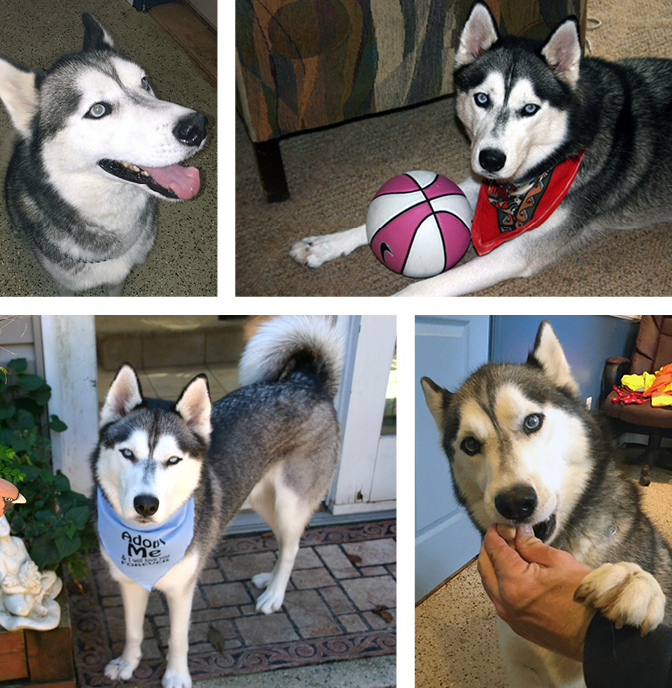 As you can see, Willie Nelson is a handsome husky with big blue eyes. Willie originally came to MaPaw with aggression issues, but we could see that he was a really good dog at heart. It was later discovered that Willie has slight problems with his sight, a degenerative eye disease common to Huskies called Corneal Dystrophy. Huskies rarely lose all of their sight to Corneal Dystrophy but his corneas will appear to have a greyish oblong area which may make his sight hazy. MaPaw’s goal was to transition this good boy from being a permanent resident into an adoptable dog, so in an effort to achieve this Willie has received special needs training from a professional trainer. Through a lot of focused work, patience, and love, Willie has become a confident dog, and the time has come to find his forever home. Willie’s adoptive family will need guidance with this special needs boy, and will have to work with MaPaw for a transitioning process, requiring several visits to MaPaw in order to get to know Willie before moving with you to his new home. Those who’ve worked closely with Willie believe the optimal conditions for him are a stable home with a human(s) home most of the time in order to offer Willie proper companionship. Willie could do well with calmer doggy companions who are his same size (no small dogs or other small animals). Willie is good with older children, but not with toddlers or babies due to their abrupt or unpredictable movements and noise level. Willie loves to go for brisk walks, loves car rides. Willie might be okay in a home without a fenced yard if the appropriate level of activity is provided for him. Do you have questions about Willie? Send an email.